Australian republicanism goes back to the earliest days of the colony, says history editor Dr Glenn Davies. The question of whether or not Australia should be a republic has been debated for longer than most people imagine. In early colonial NSW, the American rejection of British rule and the violence of the French Revolution was well known. Republicanism was often used as political language to challenge government authority and only hardened the resolve of those in power to savagely repress any supporters. In 1795, the ‘Scottish Martyrs’ arrived. The many Irish convicts brought with them antipathy towards the British. 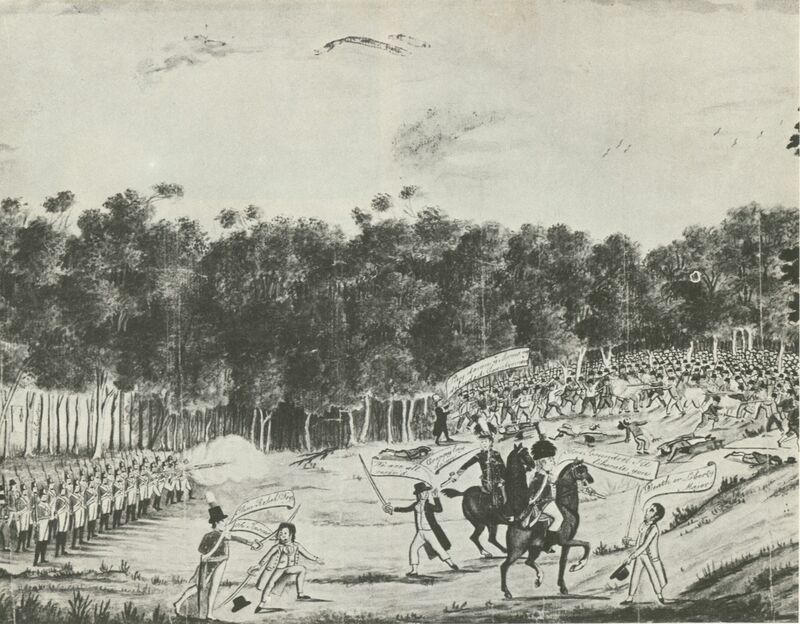 Convict uprisings such as the 1804 Castle Hill rebellion were labelled republican. But in most cases the convicts were not looking for political change, they just wanted to return home. The period from 1840 to 1856 was one in which colonial grievances reached their height. In Sydney in 1850, the outspoken firebrand Reverend John Dunmore Lang, the People’s Advocate editor EJ Hawksley and the young Henry Parkes campaigned through the Australian League for a republican form of government when the British government wanted to reintroduce transportation of convicts. In the early 1850s during the gold rushes there was an influx of large numbers of migrants from Europe and the United States to Victoria, many of whom were sympathetic to republicanism. This caused British officials to fear the possibility of revolution. In 1854, the Eureka Stockade rebellion at the Ballarat goldfield was ultimately a republican desire for government by the people. However, the urgency vanished when responsible government was granted in 1856. In the latter half of the nineteenth century republicanism became strongly anti-monarchical and nationalist in sentiment. The ‘inevitability’ of an Australian republic became a common theme. In the late 1870s the traditional Irish enmity towards British authority can be seen in the republican sentiments expressed in Ned Kelly’s ‘Jerilderie Letter’ and later in Kelly gang member Joe Byrne’s ‘Declaration of the Republic of North East Victoria’. During the 1880s, there were fifteen republican organisations and twenty newspapers or journals in cities and major country towns. This republicanism was often focussed on struggles between capital and labour. From 1884, the Bulletin expounded a strong anti-monarchical attitude. In 1887, republicans twice defeated attempts at Sydney Town Hall to pass a loyal resolution congratulating Queen Victoria’s Jubilee resulting in an open clash between thousands of demonstrators. Soon after, Sydney had a Republican Union and a republican journal led by Louisa and Henry Lawson and George Black. It was in the Republican that Henry Lawson published “A Song of the Republic”. In 1890 and 1891, the Australasian Republican Association on the north Queensland goldfield of Charters Towers had over 700 members, published a regular journal, and established republican branches. The Australian Republican editor, F.C.B. Vosper published an inflammatory editorial at the height of the 1891 Shearers’ Strike calling for revolution and the declaration of the republic. He was arrested and tried for seditious libel but eventually acquitted. The Commonwealth of Australia was the title chosen for the new nation at the 1891 National Constitutional Convention. Although there was controversy over the republican ancestry of the term it was the title accepted in 1901. Prior to the mid-1890s, republicans had insisted that national independence could be achieved only by Australia’s secession from the Empire. However, by 1901 federation was seen as the first step on the road towards political independence. In the 1960s, republican activity was restarted by authors Geoffrey Dutton and Donald Horne. At the same time the student magazine Oz lampooned the monarchy. However, the dismissal of Prime Minister Gough Whitlam by the appointed Governor-General on 11 November 1975 outraged many Australians. Since those turbulent days, several notable Australians declared a commitment to an Australian republic. There were many Town Hall meetings and calls to ‘maintain the rage’. Republicans proposed 1988 for the establishment of an Australian republic. This was not to be. In the 1990s, the popular definition of ‘republic’ was simply the removal of the hereditary monarch. This was seen as the last step in Australia’s political development. In 1991, the Australian Republican Movement was established. In 1993, Prime Minister Paul Keating formed the Republic Advisory Committee to prepare options on how to achieve a republic with minimal constitutional change. In June 1995, he announced his goal of a republic with an Australian head of state. The 1998 Constitutional Convention helped to strengthen the debate for a republic. However, on 6 November 1999, the republic referendum was defeated because many pro-republicans voted ‘no’ as they feared that without a direct election they would gain a ‘politician’s republic’. In the 2000s, the different republican groups met in ‘Republican Gatherings’ and started working in coalition — all pulling in the same direction for the same common cause.